Click here to view Elizabeth's research publications. Elizabeth is an assistant professor of Communication at Michigan State University. Elizabeth co-founded the Family Communication and Relationships Lab with Dr. Kristina Scharp in 2015. The lab houses a collection of interdisciplinary researchers and students from across the globe interested in understanding the complex dynamics of family communication in a variety of contexts. Elizabeth's research focuses on communication processes in close relationships, especially in the context of family. 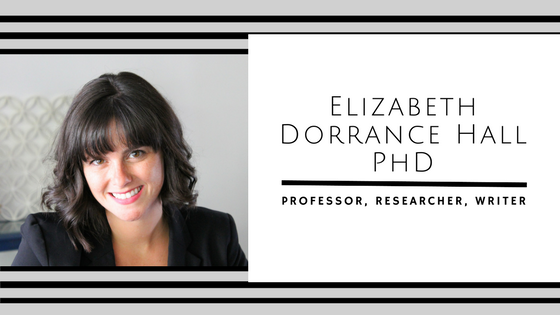 Elizabeth has applied and extended interpersonal and family communication theories (e.g., family communication patterns theory (FCP), confirmation theory) to explore how family communication is associated with young adults’ academic, relational, and psychological well-being. Recently Elizabeth and colleague Dr. Scharp secured a $74,000 Utah System of Higher Education grant to collect longitudinal dyadic (parent-child) data on student adjustment during the first year of college at Utah State University. This project involves testing and extending relational turbulence theory as it pertains to parent-adult child communication during the transition to college while providing USU an assessment of their first-year experience program. A specific and especially challenging family process Elizabeth studies is how family members become marginalized from their families of origin over time. She interviewed and surveyed people who self-identify as the "black sheep" of their family to theorize about the role of communication in the process of family member marginalization and discover meanings of marginalization, types of marginalized family members, and relationship change trajectories in these tumultuous family relationships (Dorrance Hall, online first, Journal of Social and Personal Relationships). Elizabeth also identified five resilience strategies marginalized family members used to cope with their position in the family (Dorrance Hall, in press, Personal Relationships). Two new projects in this line of work have been funded by USU internal grants and examine the marginalization and resilience strategies of women in traditionally male careers and the parent-child communication experienced by girls interested in science, technology, engineering, and math (STEM). Third, Elizabeth's research has focused on the process by which interpersonal communication influences health decisions and behaviors. She has worked to understand the influence of the multiple goals family members hold and the message features they employ when encouraging their military service member to seek behavioral healthcare (Wilson, Dorrance Hall, et al., online first, Communication Research). Another study uncovered conversational dilemmas and strategies family members use to encourage help seeking among military service members (Wilson, Gettings, Dorrance Hall, & Pastor, 2015, Health Communication). This paper was given the Award for Excellence in Family Research from Purdue University in 2016. Elizabeth's research has been published in Communication Research, Health Communication, the Journal of Social and Personal Relationships, Communication Research Reports, Personal Relationships, the Annals of the International Communication Association, the Journal of Family Communication, and the Journal of Communication in Healthcare. She has presented competitively selected papers and won top paper awards at annual meetings of the International Communication Association, National Communication Association, and regional conferences such as the Central States Communication Association and Southern States Communication Association. For more information on Elizabeth's publications and research interests, please visit her profile on ResearchGate here.